Saturday AM the number one digital manga webcomic anthology is BACK and ready to blow 2019 wide-open!! CLOCK STRIKER -shonen manga's 1st BLACK GIRL HERO! MASSIVELY MULTIPLAYER WORLD OF GHOSTS - shonen manga's 1st INDIAN-AMERICAN HERO! and many more EXCLUSIVE SERIES return with BRAND-NEW INSTALLMENTS. Check us out for the most in-depth interviews of the hottest digital artists across gaming, illustration and music alongside of some of the web's best original content. $5.00/yr -- still the BEST DEAL IN COMICS! -Twenty issues of our digital magazine with EXCLUSIVE content. $30.00/ yr -- the MOST COMPLETE DEAL IN COMICS! -EXCLUSIVE COMIC PITCH SESSIONS - PITCH SESSION! Please wait for UPDATED information regarding HOW to claim your prizes! So, what are you waiting for? 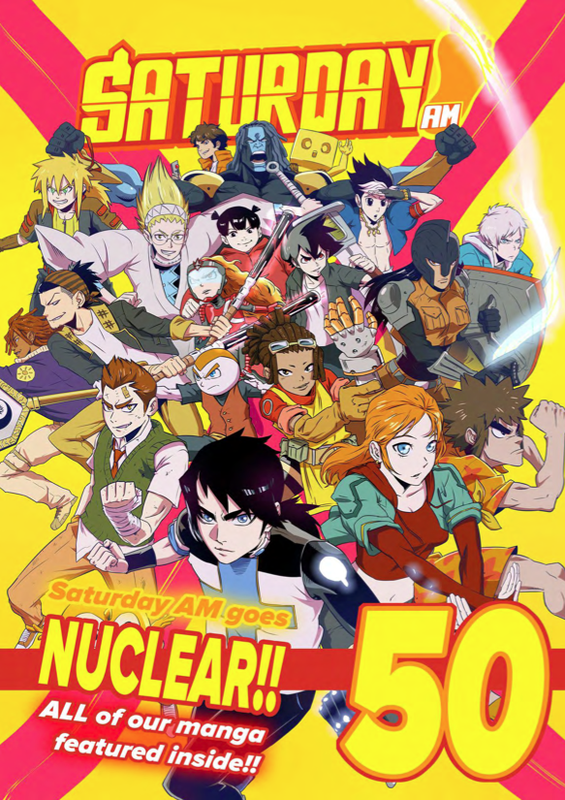 Support the most complete and original showcase for serious manga webcomics with SATURDAY AM! You'll be charged $30 yearly for the next 12 months.